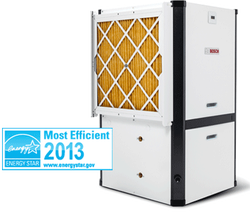 Bosch geothermal heat pump systems installed by Precision Air are some of the most energy and cost efficient on the market, as well as the greenest technology for heating and cooling your home. The technology uses the constant temperature of the earth which makes it extremely efficient all year long in virtually any climate. Call us today to start saving on your utility bills! 5 to 7 years and you can experience costs savings from the beginning. Geothermal systems use the earth as a heat source and heat sink. In order to transfer heat to or from the house, heat exchangers (ground loops) are installed in the ground. These consist of high density polyethylene plastic pipes. The loops are then connected to the heat pump and fluid is circulated through the loop piping, transferring the heat between the heat pump and the earth.